In our plan, the Brisbane CBD Protected Bike Grid will run along four streets in the CBD and link to existing bicycle facilities. It will enable anyone from ages 8 to 80 to safely ride a bicycle within the CBD of Brisbane. The grid will bring Brisbane into line with other world cities including New York, London, Paris, and Sydney which have recognised the benefits of providing safe, separated and protected bike lanes to allow people who want to get around by bicycle to do so safely and conveniently. Cities which have installed protected bike lanes have found people are attracted to ride bicycles, reducing the number of motor vehicles in the city. Cities have found protected bike lanes have other benefits too including making the street safer for all users, and increasing economic activity for businesses located along the routes. bike lane already built on George Street and it is great! It just needs extending. The many benefits of protected bike lanes. Cities in Australia and across the world are installing protected bicycle lanes and realising the benefits in making cities safer, healthier, smarter and more liveable. Protected bike lanes get more people riding bikes. Protected bike lanes are safer for everyone. Protected bike lanes are good for business. The Australian Heart Foundation supports protected bike lanes because of the benefits for health from cycling. The latest report of the Chief Health Officer of Queensland: Health of Queenslanders 2014, records that 2.5 million Queenslanders are of excess weight. The report sadly records that Queensland has the highest adult obesity in the nation, 10% greater than the rest of Australia. https://www.health.qld.gov.au/cho_report/ . The report blames obesity on the environment we live in as well as eating too much of the wrong food and moving too little. The Brisbane City Council can’t do much to influence its citizen’s dietary choices but it can influence how we move by providing transportation choices. THe Chief Health Officer’s report states that “With just over half (56%) of Queenslanders being physically active enough to achieve health benefits, we need to provide built environments, legislation, policies and programs that support people to be active”. The Brisbane CBD need not be an obesogenic environment and with protected bike lanes the CBD could easily be a healthful environment which encourages people to use active and sustainable transport. Most cities now recognise that substandard bicycle infrastructure which requires people to ride in the door zone of parked cars or close to heavy motor vehicle traffic won’t increase ridership. A national survey by the Heart Foundation and the Cycling Promotion Fund found 60% of Australians had a bicycle and over half of these people would like to cycle for transport but do not because of unsafe road conditions; speed and or volume of motor traffic and the lack of bicycle lanes. http://heartfoundation.org.au/images/uploads/publications/Cycling-Survey-2011-Riding-a-Bike-for-Transport.pdf Regardless of the health, environmental and economic benefits of getting around by bicycle, no one will ride it if they think they will be killed doing it. 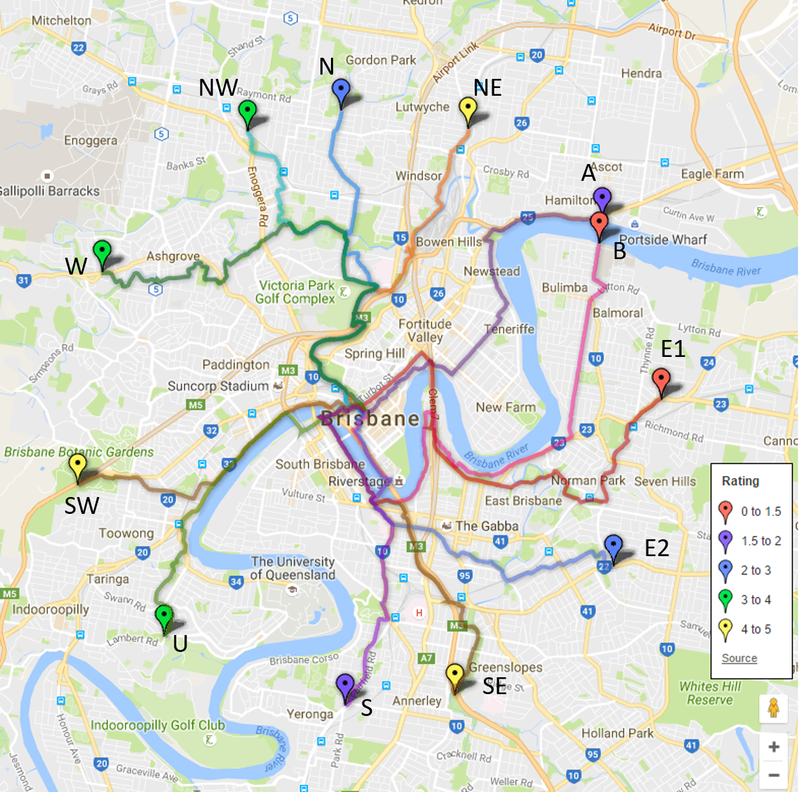 The Brisbane CBD Protected Bike Grid addresses all of these safety concerns and will help assist Brisbane realise its active transport goals of 2.5 % of transport journeys by cycling by 2016. (page 3 of the Brisbane Active Transport Strategy 2012-2026). Currently the North East corner of the Brisbane is a highly intimated area for people to access via bicycle. Accessing premises along Ann street can be quite difficult for three simple reasons: a 60km/h speed limit, it follows a ridge and exceedingly poor connection to the existing river edge paths. The Proposed Ann St protected bikelanes would solve these issues and provide for a cycling gateway to the Valley from the Brisbane CBD. Our proposal is a for a safe, separated & protected bidirectional bikelanes to run along the North West side of the Street. This would have no effect on existing Bus Stops or the peak hour bus lane that runs along the south east side of the street. It would result in the removal of just 27 on street car spaces, 8 loading zones, 3 taxi zones & 1 bus layover zone. Accessing the CBD premises on the South-East corner of the CBD from the North-West at the moment is slow and awkward. In many cases it can be quicker to make a detour via Southbank then to ride, for a new world city access to any location should be quick and easy. The proposed George St protected bikelanes would solve these issues and provide for a cycling gateway to the North from the Brisbane CBD. Our proposal is a for a safe, separated & protected bidirectional bikelanes to run along the North-East side of the Street. This would have no effect on existing operating Bus Stops affecting only one stop that is currently no longer in general use. It would result in the removal of just 12 on street car spaces, 5 loading zones, 1 taxi zones & 1 bus layover zone. Edward St should be cycling gateway for the Brisbane CBD for people coming from the South and East but it is not. The one-way nature of the street means people coming from the south and the east, have to make lengthy detours to access premises inside the CBD. The Proposed Edward St protected bikelanes would solve these issues and provide for a cycling gateway to the South & East from the Brisbane CBD. Our proposal is a for a safe, separated & protected bidirectional bikelanes to run along the North East side of the Street. This would effect 3 existing full time Bus stops and 2 peak hour only bus stops however this could be resolved with the installation of floating bus stops as used overseas to great effect. It would result in the removal of NO on street car spaces, 12 loading zones, 3 taxi zones & 1 bus layover zone. Margaret St should be a pleasant inviting urban street with it’s increasing residential developments but instead is marred with high traffic noise and speed deterring all but the very keen from riding on it. The Proposed Margaret St protected bikelanes would solve these issues and provide for a cycling connecter tying the network together providing a connected network. Our proposal is for safe, separated & protected bidirectional bikelanes to run along the South-East side of the Street. This will have no effect any existing bus stops. It would result in the removal of just 38 on street car spaces however there is many off street car spaces provided, also 12 loading zones would be affected as would 1 on street citycycle station.